In her first press conference as the newly elected president of the Chicago Teachers Union, Karen Lewis promised “the beginning of the end of scapegoating educators.” “We will be working day and night for you,” Lewis said. 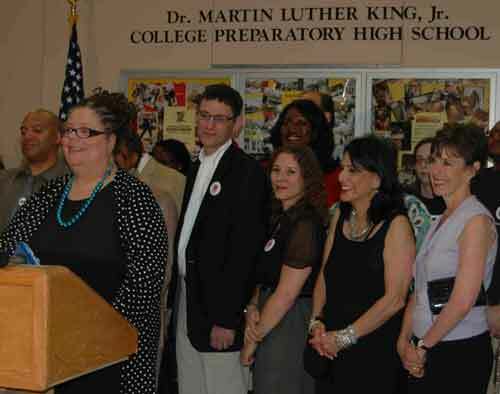 Karen Lewis, president-elect of the Chicago Teachers Union, stands with the newly elected officers and many supporters on June 12, 2010. Substance photo by Sharon Schmidt.Lewis spoke at King College Prep High School, where she taught chemistry and was the delegate to the CTU House of Delegates. She was surrounded by her slate of officers — vice president Jesse Sharkey, recording secretary Michael Brunson, financial secretary Kristine Mayle — other CORE members, and supporters from PACT, SEA, and CSDU. The group included former CTU president Deborah Lynch (who ran for president this year on the PACT slate and came in third in the May 23 vote), Ted Hajiharis, who was the SEA caucus presidential candidate, and Jack Moran, who was vice-presidential candidate on the CSDU slate. (Linda Porter, the CSDU presidential candidate was unavoidably out of town and said she would have been there if she could). Others from the alliance of union leaders that had helped to elect Lewis and CORE included Diana Sheffer, who was one of the leaders of the UPC throughout the ‘80s and ‘90s, Josephine Perry, who was Debbie Lynch’s running mate, and Pam Touras, who was on the SEA slate. 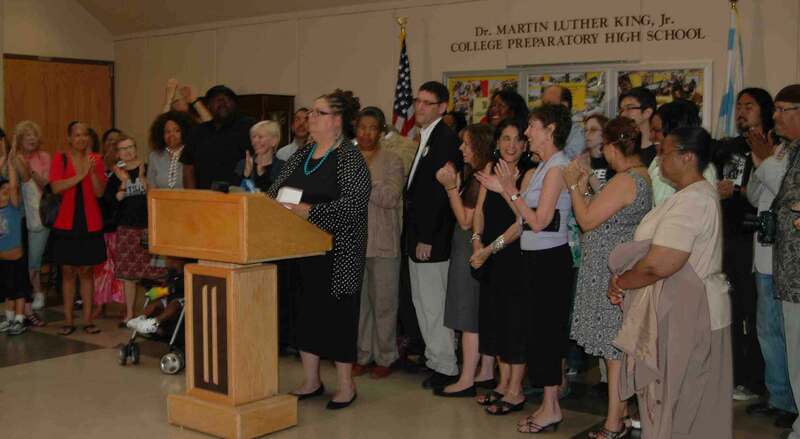 Karen Lewis (at podium) stands with part of the group that came out at the June 12 press conference to celebrate her victory. Substance photo by Sharon Schmidt.“It wasn’t just CORE,” Lewis said in response to a question from a Catalyst reporter who asked how CORE had been able to reach so many schools. “It was PACT, CSDU, and SEA.” In addition, members from community groups that had joined CORE to form GEM (the Grassroots Education Movement) were in attendance. I want to thank everyone who made today a reality – the CORE members who worked tirelessly for this day, the CTU members who voted for us, and the thousands of teachers, parents and students who stand up each and every day to improve and defend public education, often against some very powerful forces. On behalf of CPS students, I want to personally thank my fellow teachers and paraprofessional educators for the long hours you work off the clock every day under increasingly challenging circumstances. Thank you. We will work night and day to deliver on the trust you have placed in us. Today marks the beginning of the end of scapegoating educators for all the social ills that our children, families and schools struggle against every day. Today marks the beginning of a fight for true transparency in our educational policy -- how to accurately measure learning and teaching, how to truly improve our schools, and how to evaluate the wisdom behind our spending priorities. This election shows the unity of 30,000 educators standing strong to put business in its place – out of our schools. Corporate America sees K-12 public education as 380 billion dollars that, up until the last 10 or 15 years, they didn’t have a sizeable piece of. This so-called school reform is not an education plan. It’s a business plan and mayoral control of our schools, and our Board of Education, is the linchpin of their operation. Fifteen years ago, this city purposely began starving our lowest-income neighborhood schools of greatly needed resources and personnel. Class sizes rose, and schools were closed. Then, standardized tests which, in this town alone is a $60 million dollar business, measured that slow death by starvation. These tests labeled our students, families and educators failures because standardized tests reveal more about a student’s zip code than a student’s academic growth. And that, in turn – that perceived school failure -- fed parent demand for charters, turnarounds and contract schools. People thought it must be true, and it must be the teachers’ fault, because they read about it every week in the papers. And our Union that has been controlled by the same faction for 37 of 40 years didn’t point out this simple reality – what drives so-called school reform is a singular focus on profit. Profit, not teaching, not learning. Profit. In Chicago, we’ve seen CPS close 70 neighborhood schools and open 70 charters that do no better. 6,000 Chicago Teachers Union members have lost their livelihoods – their jobs – their dignity – in the process. Countless children have lost their friends, and families have lost their schools that, for most, are a source of pride, tradition and safety. Of course, just as our city’s social conditions must improve, many of our schools must improve too. But we have hundreds of thriving schools filled with dedicated, loving, and professional educators and administrators who are wise enough to empower teachers to lead. As a Union of 30,000 united educators, we have a lot of work to do … and we know we can’t do it alone. We need to work together and rethink education policy here in Chicago. I am asking that Mayor Daley and Mr. Huberman line up their allies in Springfield, and we’ll line up ours, to stop this annual ritual of “crisis budgeting”. Once and for all we need to change how Illinois funds its schools -- 60% from property taxes and 30% from the state. We need to reverse that, flip it on its head, so ALL children, no matter the value of their family’s home, have equal access to quality education. And while we’re in Springfield together, let’s make sure that the average CPS teachers’ retirement – just $39,000 a year, yes, that’s the average, $39,000 and that’s WITHOUT Social Security – is safe and sound. The law says our pension fund has to be at 90% … it’s about 60% now. We need to follow that law together. Now, back home here in Chicago, we need to put ALL the financial details on the table, because teachers got pink-slips THIS week – and yet Chicagoans have not seen a clear, transparent and detailed CPS budget. We don’t KNOW the details behind this claimed 6 hundred million deficit, that’s just what we’ve been TOLD. It’s time for the Board to give citizens all the specifics – how CPS spends our money, on what and to whom. How the 250 million in TIFs that should go to schools each year are really spent. Chicagoans need to know how charters spend their taxpayer dollars because to date, we have not seen one charter school’s financials, not one. CORE ran a clean campaign calling for a clean government. We called for budget transparency and a clear read on how social ills outside the schools impact our classrooms on the inside. Then we can start to change the conversation. Not what or who to cut, but how to save money and lower, yes, lower classroom sizes. Not whether yet another one-size-fits-all policy – the latest silver bullet – will work, but how each school can rebuild itself into a responsive learning environment. And certainly not whether open access for ALL children to high-quality public education is a luxury society simply cannot afford, but rather that true public education – great schools with great teachers – is the most important civil rights battle of our generation. And we will change that conversation because the Chicago Teachers Union is now unified. Our teachers and paraprofessionals are poised to reclaim the power of our 30,000 members and protect what we love – teaching and learning in publicly-funded public schools. It was a very impressive press conference with a moving speech by CTU President Elect Karen Lewis. Good write-up here, Sharon, and good photos. The foyer of King H. S. with its politically aware murals--so atypical of what art one usually finds in public schools--was the background for a coming together of CORE members and supporters in a space that seemed filled with warmth and unity. Thank you CORE Steering Committed, my fellow Regional Election Coordinators (I've never operated on so little sleep), and everyone in CORE or who has helped CORE. Thank you George, for your tireless work, especially as ballot counting observer. Thank you Sharon for your generosity and especially covering this story as I could not make it. Thank you Karen, Michael, Kristine and Jesse, for serving as our future officers, working tirelessly together as an organization. This election was not won in the past three months. This election has been a long time coming. It is an extension of the work that CORE started two years ago. It is an extension of why many of us became teachers, and chose to work in Chicago Public Schools, whether that was last year, or thirty years ago. I became involved in social justice work ten years ago when I was an undergraduate at Northern Illinois University. I was printing pictures in the darkroom listening to the BBC overnight when they talked about the demonstrations happening in Seattle against corporate globalization. For the first time, groups of people were coming together who had never come together before, and who had often been pitted against each other. Most memorable were the hard-hatted steel workers and the environmentalists clad in turtle costumes. That news report changed my life, because I knew then that my purpose had to be to help make this a better world. The motto of the Global Justice Movement, as it was called, was "Another World Is Possible." A lot of the issues that the Global Justice Movement took on are still with us, many of those issues directly affecting the classrooms we teachers work in. Such issues as the right to a living wage, the right to organize a union in the workplace, healthy food for our students, access to health care and social services, and for fair opportunities to learn. I know that the next three years and beyond will be tough, filled with hard work. But I think it will be good work, and this time teachers who believe very strongly in active democracy will be at the steering wheel of this union of ours. "God bless the grass that grows through the crack. Its roots they are deep and its will is to grow. And God bless the grass"
Thanks to all - a good article to summarize the gist of the press conference announcing CORE's victory over UPC - it was about all of us coming together to win for all the public school teachers today. A quick comment on vote totals - I believe roughly 60%CORE - 40%UPC - that means all the caucuses who voted against Marilyn in the first round but not for CORE, then voted to support CORE in the run-off. Then another roughly 5% former UPC schools voted for CORE. How did that happen? - Well, I think CORE did it the old fashioned way - we EARNED IT!! Karen and others spoke to many of those schools too and the teachers listened and made the logical conclusion - a vote for CORE was a vote for public education.